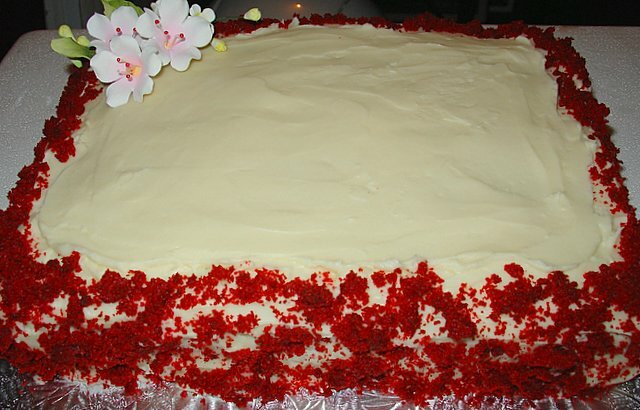 Red Velvet Cake is a cake that I make and offer on my menu to customers, but it's not really a favorite of mine. I've tried many variations over the years and always found the cake to be slightly on the dry side. In my doctored cake mix days, the cake was moist (and my husband loved it) but I wanted to find a moist scratch cake recipe. I've come to the conclusion that the best scratch red velvet cakes contain oil instead of butter. And that's what keeps it moist. The recipe I use contains oil, buttermilk and 2 tbsp. cocoa. 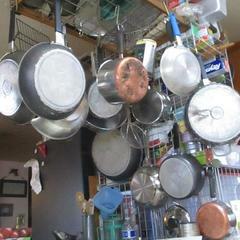 For the red color, I use 1 heaping tsp. of gel paste Super Red food coloring from a cake decorating supply shop. I've made the mistake of using other shades of red (e.g. Ruby red, tulip red, etc.) and those impart a bitter taste to the cake. Super Red food coloring has more red pigment so you don't have to use as much to get a vibrant red color. I use 1 heaping teaspoon of gel food coloring from a cake supply store. I've found that the shade of red is very important...I only use Super Red now since it has more pigment than other reds. Therefore it doesn't impart a bitter aftertaste to the cake. I've used other "reds" like Tulip Red and Ruby Red but they don't work as well. Too bitter. I've been to Cake Man Raven's store in Brooklyn and I think his red velvet cake is good. But I prefer more of a "chocolate-y" flavor. My recipe calls for 2 tbsp. of cocoa. Lorna, your cake has the color! Very tasty-looking. The frosting is different from mine -- more cream colored, mine is quite white against the red. I never use the chopped nuts, myself. One additional word on chemical ingestion: (keep in mind I use two bottles of McCormick's and I eat it once a year) It would be a good idea for all of us to limit our exposure to as many chemicals as possible. I don't think that means running around in a spacesuit, or forgoing a hot dog at the ballpark. It's about overall exposure from the atmosphere, cleaning products, foods, etc. I'm too lazy to go bag the facts right now, but they are easily researchable. We are all guinea pigs in the current environment. There are hundreds of chemicals in use that have not been properly tested, not tested over time, and not tested together. When your body exhausts itself trying to fend them off, you get multiple chemical sensitivity syndrome. I know someone who developed this. It isn't pretty. She developed it during a work project in which she spent the day in a small conference room with a brand new rug. The off-gassing of the new rug over a six month period put her over the edge. All the food I buy is organic, I try to eat at home as much as possible, I do my own baking. I also live in a big city and try to offset that unhealthy atmosphere as much as possible. Except when I have me a big slice of RVC! Yeah I totally agree with what Lindacakes said. It's a balancing act. Sure we're all gonna eat a little food color & ingest ocassional weird stuff. Some of us will scrape our kids off the ceiling, some of us will pop some Tums, whatever. Life will go on. "He who dies on the least drugs, wins." And be good to everybody 'cause everybody's having a tough time, as that other saying goes. Honestly, I got the tanginess from the batter, but it was very subtle in the baked cake. Been thinking about this. I note that Ling added an extra tablespoon of cocoa powder. Like Kris, I only use 2, and that's what my recipe calls for. Chocolate is a pretty strong flavor, and this cake is not really a "chocolate cake." It's supposed to have an underlay of chocolate, but it's not supposed to dominate. I wonder if the additional chocolate could have contributed to the tang being less noticeable in the final product. I used Jaymes's recipe; it's in Recipe Gullet. Kris, perhaps you might be interested in that recipe too. The cake was very moist. I just ate the last piece for breakfast and I liked it even more the second day. Just wondering, since most people seem to want to avoid the red dye...is the red velvet cake good enough for you to want to make and eat with no coloring--just a Velvet Cake? Or is it all about the redness. There is another red velvet thread floating around. Maybe admin can combine these two threads? Actually, I think there may be more like five. If they were combined, it probably would make it easier to find all of the myriad info, opinions, types, etc. Seems to be a fascinating topic, eh? Sure, I would make Jaymes's recipe again. It was really good and my family enjoyed it. Not really interested in trying the recipes with significantly less oil (or fat) because that they seem like they would be quite a bit drier. In some locales, though, it was called "Waldorf Astoria cake"
My aunt used to call hers a "Waldorf Rose Cake". 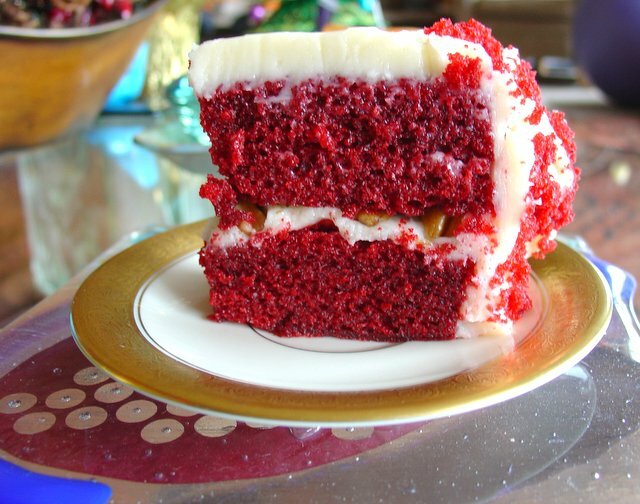 I've never seen nor tasted red velvet cake, but I find this discussion pretty fascinating. Here's an interesting article about the nature and derivation of food colorants. I couldn't find the recipe though. Jaymes was kind enough to post the link to his recipe in the other red velvet thread floating around. Thanks! Well, whoops. It seems I posted at the exact same time as Kris. Maybe an admin can remove my post as it now appears to be redundant. And this one, which, when the redundant post is removed, will be superfluous. As I see "my" recipe for Red Velvet Cake referenced around the site, want again to point out that I don't deserve much credit for it. I got it from a friend, an older neighbor lady, back in the early 70's. She swore me to secrecy, because she entered it in various state fairs and Red Velvet Cake bake-offs, many of which she won. I said, "Don't worry, I'll never tell anyone." And she laughed and said, "After I'm dead, you can tell!" So now I'm sharing it. Not only did she die a long while back, Red Velvet Cake is no longer the baking sensation sweeping the nation, and I haven't seen any Red Velvet Cake bake-offs in a very long time. But I don't want anyone to be under the illusion that I developed that particular recipe. I just had the good sense to realize how tasty it is. Not that hard to do. I finally made and tasted my first red velvet cake. I used Jaymes' friend's recipe with a couple of little tweaks. I used 1 1/2 oz of red coloring to get it really red. I have to say, if you can taste the coloring, you have a far better palate than I do. I couldn't detect anything off about it. I made a double batch of frosting, and I doubled the vanilla it called for. The buttery-flavored oil is not to be found here, so I used plain canola. I would have tried the buttery thing just once, but it seems not to be something we can get here. I made it in a half sheet pan, then trimmed the edges and made a 2 layer rectangle. I crumbed up the trimmed edges to get the fluffy crumb decoration. The optional pecans I put between the layers. People really did rave about this cake. Everyone asked how it got so red, but nobody went nuts when I said it was food coloring. I served this to 16 people and as far as I can tell, they'd all happily eat it again and again. It's more-ish, in that you do tend to keep having another little piece. Although it's very sweet, the balance of the sugar with the cocoa, buttermilk, vinegar, and cream cheese keeps you having just one more bite. BTW, you can find the butter-flavoured canola oil at Larry's in Queen Anne (now Metropolitan Market) though the last time I noticed it was a few months ago, and I haven't looked since. I finally got around to making DiH's version with the mashed beets. It is a moist chocolately cake with no taste of beets but it is not red at all. I was really turned off by the obscene amount of red coloring in my existing recipe and wanted to change it but it seems like I cant because my customers love it. It's so funny to go to parties or charity events where I am serving red velvet cupcakes and everybody's face has red and there tongues are red, it's especially fun for the kids. I made the Cake Raven recipe, with a few tweaks as well. I doubled the cocoa, used .5 oz maraschino cherry syrup and .5 oz red food coloring, doubled the vanilla, and used full-fat sour cream instead of buttermilk. By the way, the cake batter tastes totally different than it cooked. Batter tasted awful - no flavor whatsoever. Cooked, the cake's not bad. But I do taste the food coloring. Even my fingers had a scent. Gives me the heebee jeebees. Doesn't really talk about anything we haven't already discussed here, but it does give a new recipe for anyone who's curious! Uhm, maraschino cherry has a horrible fake flavor, to me, so that might have been the culprit, as opposed to the coloring.